In a world of price convergence, Europe is balancing the global LNG market. This means a stronger relationship between global LNG demand and European hub prices. To illustrate this, we look at a scenario that explores the impact of weaker Chinese LNG demand on the European gas market balance. One of our themes in 2015 has been the increasing importance of the LNG market as a driver of European hub prices. To date we have focused more on the evolution of gas supply. But we turn now to focus on the other side of the equation: gas demand growth. The global gas price convergence that has prevailed since summer 2014 means there is a strengthening relationship between global LNG demand and European hub prices. This is because Europe is acting as the swing importer of surplus LNG in an oversupplied market. We set out the logic of this relationship in a recent article here. The weaker global LNG demand growth is, the more LNG that will need to flow into Europe in order to balance the global LNG market. The more LNG that flows into Europe, the greater the downwards price pressure at European hubs. We do this with the same framework we used for the global LNG supply and demand balance scenario we presented in late April. Chinese LNG demand made headlines in Q1 2015 after suffering its first ever quarterly decline (y-o-y) since China started importing LNG in 2006. This followed LNG import growth data for 2014 (10% CAGR) which was also significantly down compared to previous years, as shown in Chart 1. This slowdown in LNG demand was consistent with a sharp slowdown in Chinese gas demand growth to 5.6% in 2014. The primary cause has been weakening Chinese economic growth and industrial gas demand. Looking forward, there is also considerable uncertainty over the evolution of Chinese gas demand. Demand growth will be heavily influenced not only by economic growth, but by the pace of a centrally planned push to reduce pollution from coal-fired power production. The level of regulated gas prices will also have an important influence on demand. Weakening demand growth in the face of this uncertainty is causing Chinese gas importers to question their future LNG requirements. 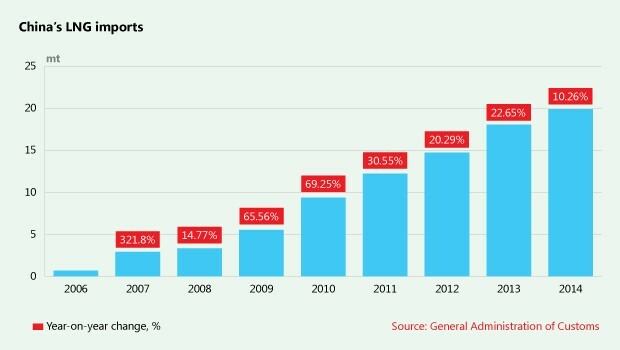 2015 has seen Chinese buyers trying to re-negotiate existing supply deals or sell contracted volumes. Importers are particularly concerned about being over-contracted in periods of lower seasonal demand. Lower LNG spot prices have added to the incentives to curtail contracted supply. 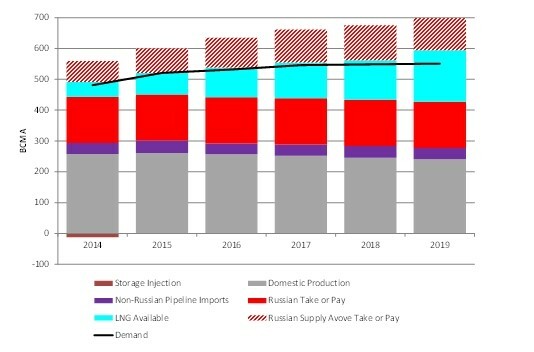 Despite aggressive future growth predictions, LNG imports although substantial, essentially remain a balancing item after domestic production and pipeline imports. But what are the implications of weaker Chinese LNG demand growth for global LNG demand and in turn the European gas market balance? In the previous global LNG demand scenario we showed in April we assumed an 18% compound annualised growth rate (CAGR) in Chinese LNG demand through until 2020. This assumption was in line with recent presentations from CNPC and consistent with current Chinese regas capacity being broadly fully utilised by the end of the decade. In order to explore the impact of weaker Chinese LNG import demand growth, we now assume only 10% growth (CAGR) in Chinese LNG demand until the end of the decade. In other words we extend the observed growth rate from 2014 out over the next 5 years. The impact of this assumption on global LNG demand is shown in Chart 2. 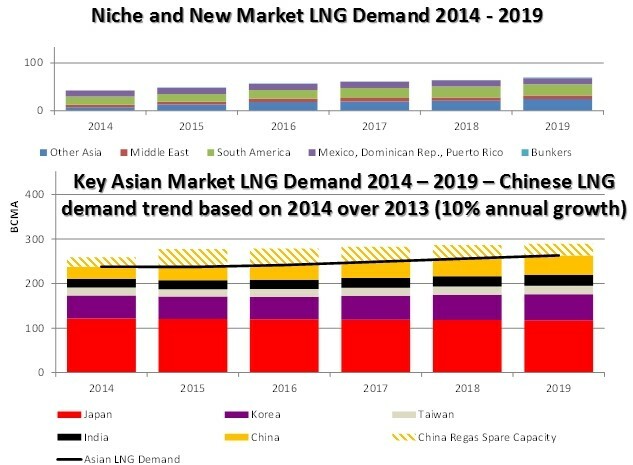 Given China is the key market driving Asian demand growth, this scenario results in materially weaker Asian LNG demand. This is set against a backdrop of a large ramp up in committed global liquefaction capacity. Unlike the relative uncertainty associated with global LNG demand, supply volume growth out to 2020 is anchored by delivery lead times on projects already under construction (see our assumptions on LNG supply ramp up here). Weaker Chinese LNG demand growth has an important knock-on effect for European hubs given Europe’s role as the market of last resort for surplus LNG. This global balancing role is supported by several factors. The UK NBP and Dutch TTF hubs offer good spot and forward liquidity to facilitate the sale of gas, ultimately backed up by the ability for hubs to absorb very large volumes of additional supply as gas vs coal switching occurs at lower prices. This liquidity is supported by the ample availability of regas capacity and a relatively friendly TPA environment. In addition European LNG supply contracts (& player portfolios) have inherently high levels of flexibility to support volume swings. The scenario impact of higher LNG import volumes on the European gas market supply and demand balance is illustrated in Chart 3. The important point to notice in this scenario is that by 2017, LNG import volumes have more than displaced annual pipeline contract flexibility (ACQ), assuming 85% annual ‘take of pay’ levels in European pipeline contracts (although as we noted here actual flexibility may be somewhat greater). The displacement of pipeline contract flexibility becomes significantly more pronounced by 2019. Once the flexibility to ramp down pipeline contract volumes is exhausted, hub prices may need to fall sharply lower in order to induce additional gas burn from Europe’s fleet of CCGT power plants. In other words under this scenario, weaker Chinese LNG demand causes the European gas market to breech the tipping point that we have described previously. We return next week to see how vulnerable this tipping point is to a weakening in European gas demand.